Mount Fraser, Mount Bland, Beveridge Hill. 37 27 50S 144 58 43E (external link); 7823-2-2 (Wallan) 214519. 5 km S of Wallan. Beveridge-Woodstock Road. 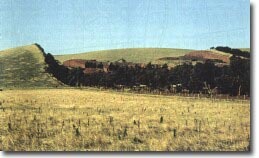 Grazing and quarrying, large planted pines. Mount Fraser is a large scoria cone complex with two craters. 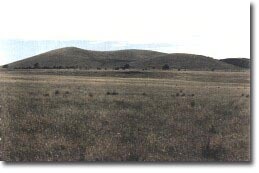 The diameter of the base averages 1200 m and the highest point on the rim rises 125 m above the basalt plain immediately east of the Hume Freeway. It is a relatively simple volcanic structure with no tuff ring or parasitic cones. The cone has steep, straight sides and a high, intact northern rim but the southern rim has an uneven margin. This may be due to there being several closely spaced vents, to uneven fire-fountaining of scoria during eruption, or collapse or breaching by explosion or outflow of lava. There is a wide, shallow crater open towards the southwest and a smaller closed inner crater. The cone is the youngest element of a volcanic system that initially erupted large volumes of fluid basalt and was the source of much of the lava that flowed along tributaries of the Yarra river. K-Ar dates between 1.06 and 0.82 million years for the lava flows give a maximum age for Mount Fraser, as the scoria cone was the final phase of the eruption process. The only natural exposures of rock on the care are in the lava flows around the base. A large scoria quarry operating at the 350 m level on the southern slope is a major supplier of scoria for Melbourne. The quarry exposed bedded coarse scoria with occasional volcanic bombs. Studies of the ejecta have shown it to be from a primary mantle-derived magma. The scoria is a relatively minor component of the total volcanic ejectamenta but forms the most conspicuous topography of the area. This is the largest scoria cone near Melbourne and ranks as one of the larger on a comparative scale with other cones in the Newer Volcanics Province. Its location on a low eruption lava plain with little relief makes it a conspicuous element of the terrain of the plains north of Melbourne. It provides a clear illustration of the typical form of a simple scoria cone with straight sides and a well-defined base contour. It is one of the younger volcanic features of the Melbourne district and is one of a very small number of scoria cones in the eastern (Melbourne) sector of the Newer Volcanics Province. Peridotite inclusions in basalt ejecta from Mount Fraser have been used in developing models of petrogenesis of Newer Volcanics basalts. Mount Fraser is also significant as a source of lava flows that filled the valleys of some of the northern tributaries of the Yarra River. Edwards, A.B. (1938). The Tertiary volcanic rocks of central Victoria. Quarterly Journal of the Geological Society of London 94, pp. 243-320. Hanks, W. (1955). Newer Volcanic vents and lava fields between Wallan and Yuroke, Victoria. Proceedings of the Royal Society of Victoria 67, pp. 1-16. Frey, F.A., Green, D.H. & Roy, S.D. (1978). Integrated models of basalt petrogenesis: a study of quartz tholeiites to olivine melilitites from southeastern Australia. Journal of Petrology 19, pp. 463-513. VandenBerg, A.H.M. (1973). 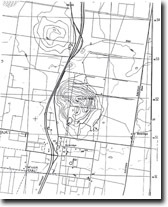 Geology of the Melbourne district. In J. McAndrew & M.A.H. Marsend (eds) Regional guide to Victorian geology (2nd edn). School of Geology, University of Melborune, pp. 14-30. VandenBerg, A.H. M. (1992). Report on the Kilmore 1:50 000 geological map. Geological Survey of Victoria Report 91.